Dozens of families who remain fiercely loyal to Col Muammer Gaddafi’s regime are trapped in the Libyan desert as fighting intensifies in the loyalist stronghold of Sirte. Families continue to stream out of the city, as interim government forces fought intense battles for control of the city centre. But many men and women were too terrified, angry and mistrustful of the fighters that now control the majority of Libya, to flee to the next town. Crammed 30 people to a room, the families live in an abandoned school building with scant supplies. 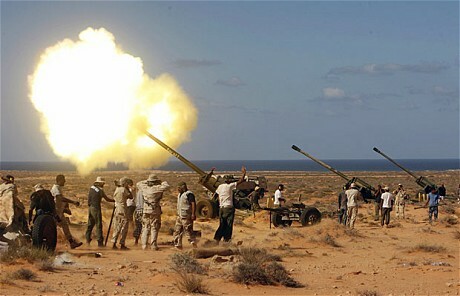 Others have been taken in by loyalist homes dotted in the scrubland surrounding Sirte. Backed by Nato war planes, rebel forces battling over the last eight months said they were fighting to oust a brutal dictator that was loathed by the Libyan population and that suppressed the basic human rights and freedoms of civilians. But families fleeing Col Gaddafi’s home town of Sirte said they longed for Libya to be “just as it was”. “We lived in democracy under Muammer Gaddafi, he was not a dictator. I lived in freedom, Libyan women had full human rights. It isn’t that we need Muammer Gaddafi again, but we want to live just as we did before,” said Susan Farjan. Despite the living conditions, and her plain dirty clothes, Susan’s makeup, Chanel perfume, diamond earrings and gold necklace told of a better life in times past. Sitting on the hard floor of the school classroom that had become her home Susan reminisced: “Life was great in Sirte. I was a television presenter for Jumareya television, interviewing pop stars, and reading the news. Everyone loves Gaddafi. My father loves him so much, the blood is green in his veins,” she said as tears welled in her eyes. The desert surroundings of Sirte have become a patchwork of loyalties. Interim fighters patrolled ‘liberated areas’ celebrating the new found freedom of the country. But many families in the area said Nato bombing and more recently, the attacks by interim government forces had turned Sirte into a ‘living hell’ “I saw missiles and bombs and rebel fighters. There were missiles everywhere; that’s why we came here,” said Mabrouka Farjan, 80. “Life was good under Gaddafi, we were never afraid.” “The insurance building in the city has collapsed, there are many dead bodies in there, and you can smell the stench on the streets,” said Mohammed Farjan, 27, speaking of the situation inside the city. Caught in the crossfire as they were fleeing, two children were killed, and a mother seriously injured on Saturday when their car was hit by a rocket propelled grenade. Others recounted stories of their homes hit by rockets. “They are killing our children. Why are they doing this? For what? Life was good before!” shouted another elderly lady. The rebel army has said it would leave unarmed loyalists to their own devices, but some families reported harassment. “Yesterday men came with anti-aircraft guns, they surrounded our home, and tried to steal our cars. We hit back, and eventually they left,” said Ibrahim, who would not give his last name for fear of recriminations. The opposition forces have been allowing them to get supplies said the families, and there is some medical assistance. But interaction is fraught with tension and insults. “They constantly come and demand our papers, and try to search all our possession for hours,” said an elderly man. “Everyone loves Gaddafi, and we love him because we love Libya. Now the rebels have taken over. We might have to accept that, but Muammer will always be in our hearts,” said the mother of one family.